Controlling Etching Vapors during Fluoropolymer Prep - Sentry Air Systems, Inc.
Fluoropolymers are fluorocarbon based polymers with multiple strong carbon-fluorine bonds. The most common fluoropolymer is polytetrafluoroethylene (PTFE) which is known for its lubricity or virtual lack of surface energy. PTFE was accidentally discovered in 1938 by DuPont Ph.D. Roy J. Plunkett. While working with tetrafluoroethylene gas, he noticed that a previously-pressurized cylinder had no pressure remaining. In dissecting the cylinder, he found a mass of white solid in a quantity similar to that of the tetrafluoroethylene gas. It was determined that this material was a new-to-the-world polymer. Tests showed the substance was resistant to corrosion from most substances and had better high temperature stability than any other plastic. This discovery paved the way for products such as Teflon® and non-stick cookware. In addition to its “non-stick” properties, fluoropolymers have other useful traits like high wear and chemical resistance, dielectric strength and temperature resistance; making it a popular choice in a variety of industries. One of the most sought after traits of fluoropolymers, its high lubricity, is also one of the trickiest traits to handle. Its ability to resist solvents, acids, and bases makes it difficult to adhere to other surfaces. In order to apply fluoropolymer film or sheets to another surface, you have to etch the film on the side you wish to bond. There are many products on the market today that supply fluoropolymer etchant to make bonding possible. Tetra-Etch® is one such etchant that is used to prepare the surfaces of fluoropolymers prior to bonding, marking or potting. The chemicals used in fluoropolymer etchants are highly volatile and emit vapors that may be hazardous to ones health if inhaled. The Tetra-Etch MSDS indicates three major components: 1, 2 dimethoxyethane; Naphthalene; and Sodium Metal. Naphthalene is known to cause headaches, confusion, malaise, optical neuritis, and additional symptoms when exposed through inhalation. Target organs can include liver, kidneys and central nervous system. The National Institute of Occupational Safety and Health (NIOSH) and OSHA have set time weighted average exposure limits (TWA) for naphthalene over an 8-hour period. Both have set limits at 10 ppm TWA. 1, 2 dimethoxyethane also has acute and chronic side effects from inhalation exposure including lung and mucous membrane toxicity. While handling the etchant, these chemicals emit odorous fumes that contaminate the surrounding air; making proper ventilation critical to the overall health and safety of the worker. For removing these harmful, odorous vapors we recommend a ductless fume extraction system equipped with high-quality carbon filters. Our Model 450 Portable Fume Extractor is an excellent solution for high capacity applications where portability and flexibility is needed. 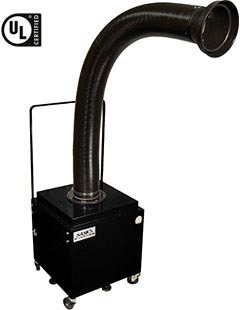 Capable of up to 950 CFM, this unit provides industrial-strength fume extraction. 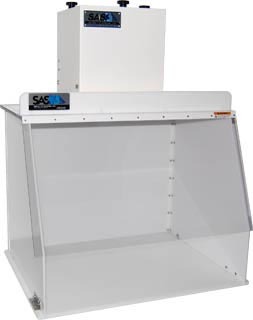 For more contained applications where small parts are being used we recommend a ductless fume hood. Available in a variety of sizes from 12” – 70” wide, our hoods provide a contained workspace and the ductless technology requires no exterior venting. Our line of activated carbon filters and specialty blended carbon filters provide highly effective odor extraction. Made of 100% virgin coconut shell our granular carbon filters are extremely porous and adsorb both chemical and solvent vapors. For more information on controlling etchant vapors, give Sentry Air Systems a call today 1-800-799-4609, email sales@sentryair.com, visit our website or fill out the feedback form below. 1^ “Market Report: Global Fluoropolymer Market”. Acmite Market Intelligence.